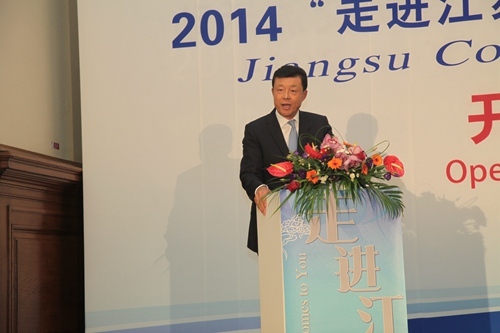 It is a real pleasure for me to attend the opening ceremony of Jiangsu Comes to You 2014 and Yangzhou Day. On behalf of the Chinese Embassy in the UK I would like to extend warm congratulations. First, business and trade. In 2013 trade between Jiangsu and Britain reached 9.3 billion US dollars, accounting for over 10% of total China-Britain trade. 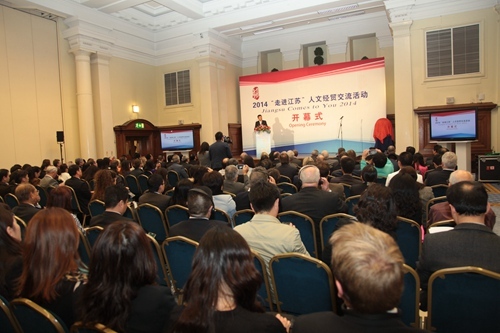 British businesses have shown a strong interest in investing in Jiangsu. As a result, 20% of total British investments in China found their home in Jiangsu. Likewise, Jiangsu’s investments are also making headway in Britain. Last April, SanPower Group of Jiangsu purchased British department store House of Fraser. This is the first time that a Chinese private company has bought a British retailer store. Second, science and technology. As China-UK science and technology cooperation deepens, Jiangsu and Britain have carried out effective cooperation in international technology transfer, inter-governmental projects and building joint labs. This morning, Governor Li Xueyong has just witnessed the signing of MOU on scientific innovation between Jiangsu and Britain. This set up a new mechanism for collaboration in industrial R&D. Third, people-to-people and cultural exchanges. Back in 1992 Essex and Jiangsu became sister county and province. Now more than 100 middle and primary schools from both sides have established links. Collaboration between institutions of higher education of Jiangsu and Britain has enabled them to combine strengths. Moreover, London and Nanjing, provincial capital of Jiangsu respectively hosted 2012 Olympic Games and 2014 Youth Olympic Games. Olympics have brought the cities and their peoples closer. I am glad to learn that trade, science, technology and culture are high on Governor Li’s agenda during his visit. I am sure his visit will further promote exchanges and cooperation between Jiangsu and Britain in the three areas. At present, China-UK relations are on a fast track. We are working together to build a partnership of common growth and inclusive development. Against this background, I have no doubt that Governor Li’s visit and Jiangsu Comes to You 2014 will further boost the growth of overall China-UK relationship. In conclusion, I wish Jiangsu Comes to You 2014 a great success. I also hope cooperation between Jiangsu and Britain will be more productive and more fruitful!